Inspired by the national movement of Bad Dudes and Nasty Women born in the land of writer/provocateur Holly Hughes, the Seattle chapter of the performance movement Not MY Presidents’ Day brings together performers/artist/activists notoriously well-known in the Seattle Performance community and others coming up who are the artists to watch for in our immediatefuture. In reverse alphabetical order, the artists will include vocalist Naomi Wachira, the women of ShatterZone Dance, writer David Schmader , burlesque artist Scandal from Bohemia , actor Rudy Roushdi, Xolie Morra & The Strange Kind,lelavision‘s sculpture sound dance, Teatro Zinzanni’s Kevin Kent, piano man Victor Janusz, actor/singer/writer Justin Huertas, Randy Ford in his solo dance Queen Street, raucous ringleaderRebeccaMm Davis , musicians Abel Rocha, Madeleine Sosin and Amy Denio of Correo Aereo(Air Mail) and a few other surprises! Performers will install in the three story historic landmark and audiences will be invited to roam and engage in advice booths, a cash-bar speakeasy, sound sculpture installations and more unpredictable stations. At approximately 8 pm, the performances will begin. There will be a twenty minute intermission—snacks will be available and the cash bar will be open. 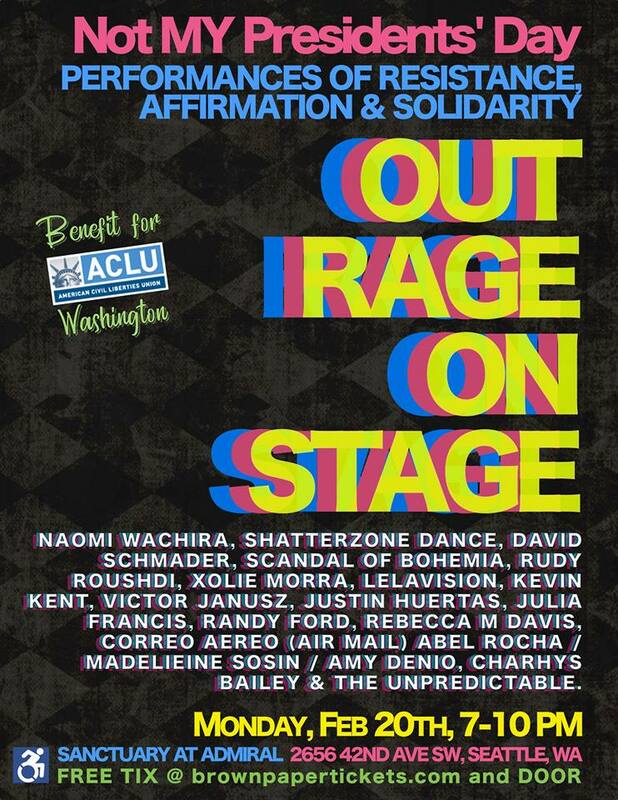 All profits will be donated to the Washington State Chapter of the ACLU. Free to the Public. Tickets can be secured viawww.brownpapertickets.com/event/2866288 and will be available at the door, space permitting.